Successfully Added ESCAM Ant QF605 Security Camera - WiFi, Motion Detection, 720p HD, Remote Access, Night Vision, IR Cut to your Shopping Cart. The ESCAM Ant QF605 is a mini security camera that easily allows you to keep track of what’s happening inside your property. This indoor IP camera features an extremely sleek and small design. It comes with a removable stand and wall bracket that lets you easily attach it anywhere you wish. With its WiFi connectivity, this wireless IP camera can be accessed from afar through your smartphone. The security camera supports iOS, Android, and Windows devices. Up to 4 people are able to enjoy the remote real-time view at once. Thanks to this, you’ll always be able to keep an eye on your property even when you’re not physically around. With Dual-Way audio support, this mini IP camera lets you communicate with visitors or possible intruders. The nanny cam comes with a sophisticated sensor that produces crisp 720p HD footage. Thanks to this, you’ll always be treated to detailed and recognizable images. With its IR-Cut technology and night vision support, this indoor security protects your home or office around the clock. If you’re looking for an affordable and easy way to upgrade your home security, the ESCAM Ant QF605 WiFi camera is perfect for you. 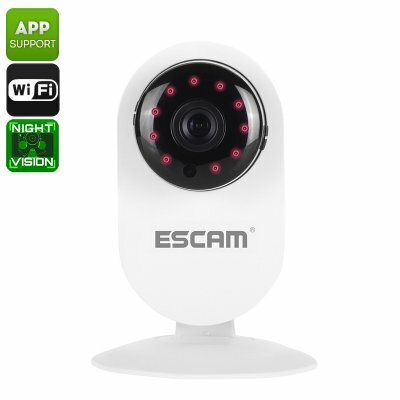 The ESCAM Ant QF605 comes with a 12 months warranty, brought to you by the leader in electronic devices as well as wholesale IP cameras..